Widgeon grass has been discovered in South Bethany canals. Although good for the environment, the grass is causing headaches locally by tangling in boat propellers. What’s worse than a weed that nobody wants? For South Bethany, it’s a weed that everyone wants. “We have a presence in our canals in the southern end… It’s the first time we’ve seen it,” Frank Weisgerber told his fellow South Bethany Town Council members on July 13. Although algal blooms are down this year, a new grass has appeared instead, growing upward from the sediment in the canal beds. After photos of the grass were sent to experts at the University of Delaware and Department of Natural Resources & Environmental Control (DNREC), scientists responded gleefully that South Bethany had widgeon grass. That’s really good news for a watershed. Unlike algae, which blocks sunlight and eats up oxygen, widgeon grasses can “provide nursery grounds for fish and blue crabs, serve as food for animals such as turtles and waterfowl, clear the water by reducing wave action and absorb excess nutrients,” DNREC’s Shoreline & Waterway Management Section said, through spokesperson Michael Globetti. “In marine environments, most efforts by states are now focused on restoring SAVs,” or submerged aquatic vegetation, Globetti said. “They’ve been trying to get this grass to grow in the coastal bays, as well as the Chesapeake Bay. … Lucky us — we have it without even trying to,” Weisgerber said wryly. But South Bethany doesn’t want it, and DNREC won’t let them remove it. 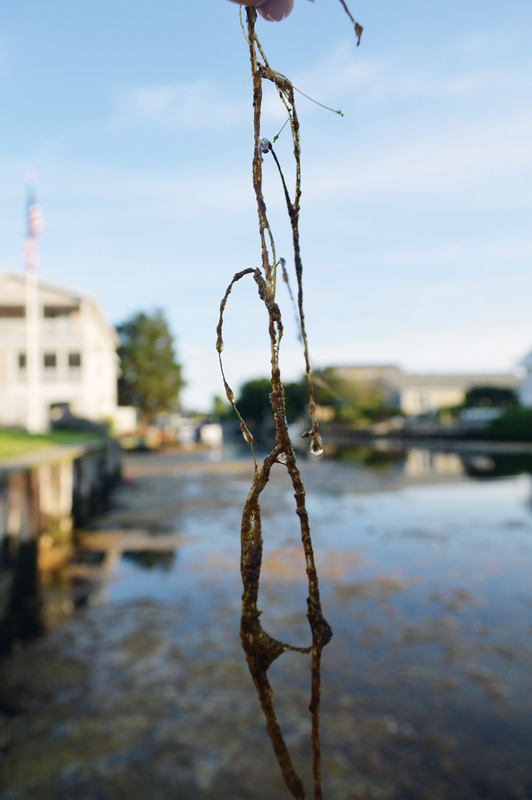 The thread-like grass grows about three feet tall, from the bottom sediment (which the Town hopes to dredge away at some point, to increase water depth and flow). Boat propellers are getting tangled in this mass of grass and small leaves. That’s a big deal in South Bethany, where the majority of homes are canalfront. “When our property owners show up this weekend, there’s going to be a firestorm,” Weisgerber said. “The canal is filled with this stuff. I could walk across it, probably,” quipped Councilman Don Boteler, saying he’s seen the widgeon grass filling the Sussex Canal, touching both sides, but not literally thick or strong enough to walk on. It’s a “boom or bust” species, meaning the grass could spread like wildfire one year then die out the next. Ironically, the grass appeared about the same time that South Bethany launched 10,000 cordgrass plants into the canals on 130 small floating wetlands to help build habitat and soak up excess nutrients. Although South Bethany owns the canals, they still need DNREC permission for any water-based project, right down to removing live plants, building a homeowner dock or installing those 130 floating wetlands. “This is not a question of the department not allowing the Town of South Bethany to take action on their own concerning widgeon grass, since the Town owns the lagoons. However, the department, knowing the environmental benefits associated with SAVs such as widgeon grass, does not harvest this vegetation,” Globetti stated. Although he told the Coastal Point that “there are no DNREC regulations or permitting requirements prohibiting the harvesting of submerged aquatic vegetation. South Bethany can act on the widgeon grass as the Town sees fit,” Weisgerber said other DNREC staff would not allow South Bethany to cut the live grass. Weisgerber has learned that the Town may remove the dead plants in the top-center of the canals, with no permits required. DNREC’s own algae harvester might even be available for that project. But South Bethany still cannot harvest the live plants on the bottom or along the bulkheads. Weisgerber said he has reached out to state Sen. Gerald Hocker Sr. for help, and he and the Town staff will research companies to clear the dead plants.